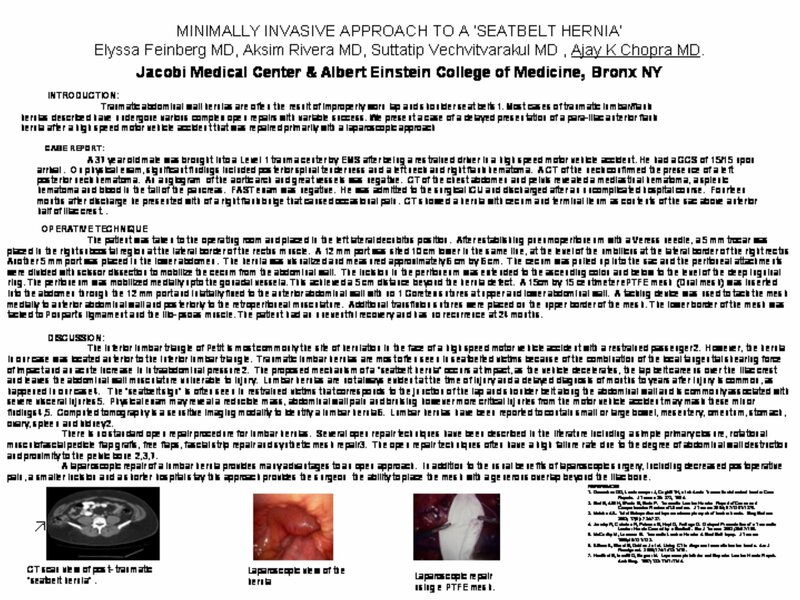 A MINIMALLY INVASIVE APPROACH TO A ‘ SEATBELT HERNIA’.Elyssa Feinberg MD, Aksim Rivera MD, Suttatip Vechvitvarakul MD , Ajay K Chopra MD. Introduction: Traumatic abdominal wall hernias are often the result of improperly worn lap and shoulder seat belts. Most cases of traumatic lumbar/flank hernias described have undergone various complex open repairs with variable success. We present a case of a delayed presentation of a Para-iliac flank hernia after a high speed motor vehicle accident that was repaired primarily with a laparoscopic approach. Case report: A 37 year old, obese male was brought into a Level I trauma center after being a restrained driver in a high speed motor vehicle accident. On physical exam, significant findings included posterior spinal tenderness, a hematoma of the left neck and a large right flank hematoma. Cat scan of the chest, abdomen and pelvis revealed a mediastinal hematoma, a splenic hematoma and blood in the tail of the pancreas. He had an uncomplicated hospital course and was discharged. Four months after discharge he presented to the clinic complaining of a right flank mass that caused occasional pain. Cat scan showed a large hernia with complete separation of abdominal wall musculature from the iliac crest with cecum and terminal ileum as contents of the sac. A laparoscopic mesh repair was carried out with some modification of standard ventral hernia repair technique. Twenty month after the repair, there is no recurrence. Comment: A laparoscopic approach can be successfully applied with excellent results for post traumatic flank hernias.